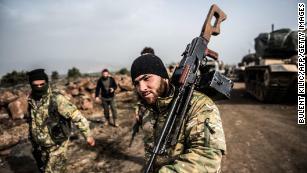 Beirut, Lebanon (CNN) A US-backed Kurdish militia is diverting 1,700 fighters from the battle against ISIS and redeploying them to northwest Syria to repel an offensive by US ally Turkey, in a development could hinder the fight against the terror group. Four branches of the Syrian Democratic Forces (SDF), thus far tasked with defeating ISIS in Syria, have been transferred from east of the Euphrates Rivers to the Kurdish enclave of Afrin, SDF spokesman Mustafa Bali told CNN in a statement. “We won’t abandon our positions, but since the beginning of the invasion of Afrin we have said that Turkey is trying to give ISIS another chance at life, and directly affects military operations and campaigns against ISIS,” said Bali. “Now, offensive operations have ended and we have transformed from a force that hunted ISIS to a force that is concentrated in defensive positions,” he added. Bali said the “majority” of the alliance’s forces are moving to Afrin. The US-led coalition warned that the SDF’s move could slow the campaign to defeat ISIS. “The departure of some SDF forces from the Middle Euphrates River Valley highlights the potential costs of any distraction from the defeat-Daesh fight,” said coalition Director of Public Affairs Col. Thomas Veale, using the Arabic acronym for ISIS. Turkey, a NATO ally, launched an operation targeting Kurdish groups in Afrin in January to clear the border area of militias it considers to be terrorist organizations. Three Kurdish militias — the Kurdish Democratic Union Party (PYD), the People’s Protection Units (YPG) and the Kurdistan Workers’ Party (PKK) — have borne the brunt of the offensive. The YPG is considered the backbone of the US-backed SDF, which was instrumental in eliminating ISIS’ territorial foothold in Syria. Turkish presidential spokesman Ibrahim Kalin has said it is Turkey’s “natural right” to ask the US to halt the SDF’s redeployment to Afrin. The United Nations on Sunday said it was receiving “disturbing reports” of civilian deaths in the northwestern Syrian enclave, and that it believes “tens of thousands” have been displaced. 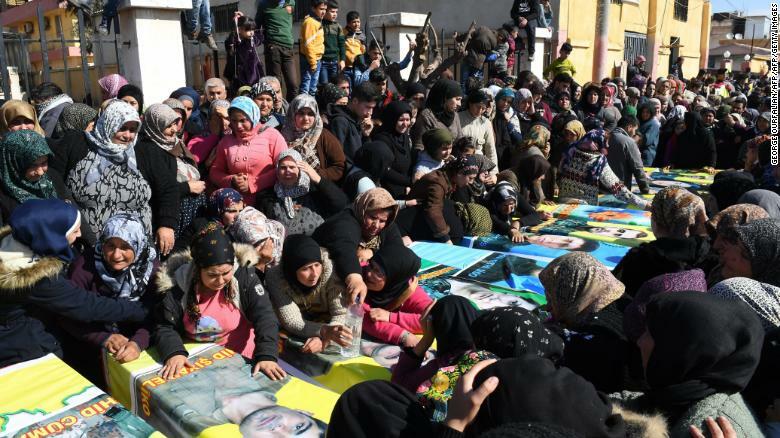 Syrian Kurds attend a funeral in Afrin in mid-February for Kurdish fighters. Turkey has said that the nationwide ceasefire ordered by the UN Security Council last month would not affect its Afrin offensive. 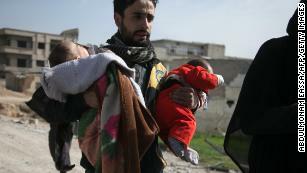 The ceasefire has also been ignored by Syrian government forces and rebel groups, mainly in the Damascus suburb of Eastern Ghouta, where fighting has caused heavy civilian casualties. Redeployed SDF forces will be joining pro-Syrian government fighters who entered Afrin last month as part of a deal between the regime and Kurdish forces. Turkey’s deputy prime minister warned at the time of “disastrous consequences” should Syrian government forces intervene in Afrin. Meanwhile, Syrian government forces continue to pummel the rebel enclave of Eastern Ghouta, where the UN says more than 600 people have been killed in recent weeks. “It is urgent to reverse this catastrophic course, and to refer Syria to the International Criminal Court,” said Al Hussein, according to a UN statement. “Nearly half of the food” aid bound for besieged Eastern Ghouta, where reports of malnourishment are rampant, had to be returned, according to the United Nations. A 46-truck aid convoy — some vehicles stripped of desperately needed medical kits — brought some supplies to the area on Monday, but activists said the convoy had to pull out before everything was unloaded. UN Secretary-General António Guterres called on all parties in Syria to “immediately allow safe and unimpeded access” for aid convoys to “deliver critical supplies to hundreds of thousands of people desperate need” in the Damascus suburb, according to a statement from spokesman Stephane Dujarric on Tuesday. Activists say that many of Eastern Ghouta’s residents have taken to makeshift shelters underground, rarely venturing above ground to seek food and water amid nearly incessant airstrikes. The Syrian government continues to send reinforcements to the rebel enclave, where a ground offensive is underway and regime forces are reported to have captured large tracts of farmland. Isil Sariyuce contributed to this report from Istanbul. Turkish President Recep Tayyip Erdogan kisses Amine Tiras, a young girl in military uniform as he speaks to his ruling party members, in Kahramanmaras, Turkey, Feb. 24, 2018. ANKARA, Turkey — Turkish President Recep Tayyip Erdogan has come under criticism for telling a small girl dressed in a military uniform that she would be honored if she were “martyred” for Turkey. Turkish President Recep Tayyip Erdogan holds Amine Tiras, a young girl in military uniform as he speaks to his ruling party members, in Kahramanmaras, Turkey, Feb. 24, 2018. His action comes as nationalist sentiment is running high over a Turkish cross-border military offensive against Syrian Kurdish fighters that are affiliated with Kurdish rebels fighting inside Turkey. In recent weeks, children dressed in commando uniforms or reciting nationalist poems have been making appearances in many events that he attends.